Quiet Setting For Two - Just 5 Miles To Downtown Plaza! Property 7: Quiet Setting For Two - Just 5 Miles To Downtown Plaza! Santa Fe - Only $70 a Night! Property 8: Santa Fe - Only $70 a Night! Property 12: Cozy 'Casa Solar' Studio - Walk to Santa Fe Plaza! Xtra Discounts on 1 Month+ stays!! VinGarage Winemaker Atelier Pets Yes! Property 16: Xtra Discounts on 1 Month+ stays!! VinGarage Winemaker Atelier Pets Yes! Lovely Garden Apartment 15 minutes from Santa Fe Plaza! Property 17: Lovely Garden Apartment 15 minutes from Santa Fe Plaza! Property 18: Luxurious Studio, original adobe walls, new solid wood floor, a real sanctuary. 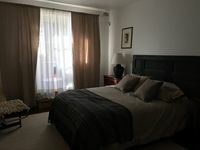 1 Bedroom Relaxing Apartment - Only 5 Miles to Plaza! Property 25: 1 Bedroom Relaxing Apartment - Only 5 Miles to Plaza! Comfy Studio for Two. A short 5 miles to SF Plaza! Property 26: Comfy Studio for Two. A short 5 miles to SF Plaza! Property 27: NEW! 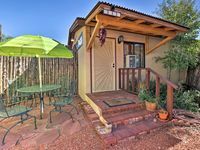 Cozy Santa Fe Apt w/Patio-6 Mins to Downtown! Property 29: NEW! Rustic Santa Fe Apt w/Patio - Walk Downtown! Casa Amelia - One block from Canyon Road! Property 38: Casa Amelia - One block from Canyon Road! Property 44: WALK TO EVERYTHING OR TAKE FREE BUS. Walking Distance to Downtown Plaza! Property 45: Walking Distance to Downtown Plaza! Great quiet space to relax and unwind. The studio had a great home like feel to it, and Vero was a great host. Very close to the Capitol and the plaza. I highly recommend the space to anyone visiting Santa Fe. Clean, coffee available! Comfy bed, great location, super quiet, great shower!